After a fire, a board-up of your property may be necessary to secure your property and prevent future damage from vandalism, theft or bad weather. Broken windows, damaged doors, openings in the roof and other open areas will be boarded up. We are always staying on top of the latest advancements in smoke damage restoration. We use state-of-the-art equipment to mitigate fire damage and restore your property, including dry ice machines, which remove soot from wood, and our thermal foggers, which enable us to immediately restore the air quality of your property. All our technicians are certified by the IICRC (Institute of Inspection, Cleaning and Restoration Certification) and are trained and qualified to use this equipment to properly clean and restore your property up to IICRC standards. We’ll restore damage caused by fire, smoke, ash, heat and soot and document the job with before-and-after photos. We also extract the water that was used to extinguish the fire, and we dry out your property and belongings. We specialize in the complete pack-out and restoration of the salvageable contents of your property. We want to ensure that you not only get the inside of your property restored to its original condition but also the salvageable items in it. (Burnt or charred items are non-salvageable.) Restoration services include cleaning furniture, electronic equipment and documents. After they are restored, we’ll store your belongings in a safe, climate-controlled environment until you’re ready for their return. Our IICRC-certified technicians will identify the source of the odor, remove the source and employ proper cleaning methods and cutting-edge products to fully clean the area. For deodorizing, we use ozone, the strongest commercially available oxidant, which destroys the odor-causing molecules rather than just cover them up. A thermal fogger is used to deliver the deodorizer so that it gets into all the nooks and crannies. The fog will leave behind a pleasant odor that neutralizes any unwanted smells. We coordinate the salvage of special items that are damaged but not scorched, such as paintings, documents, medical records or important legal paperwork. We send these to a company that freeze-dries the items and slowly thaws them using a sublimation process with specialized equipment. We can restore electronic items, such as home theater systems and computers, that have been damaged by smoke or that have partially melted on the outside. If the CPU of a computer was burned, we can retrieve the data from the hard-drive. To repair hard drives, the data can be extracted and reinstalled in a replacement hard drive. If the casing of a TV or other electronic appliance is damaged or even warped or melted, we can replace the casing and return a functioning piece of equipment. 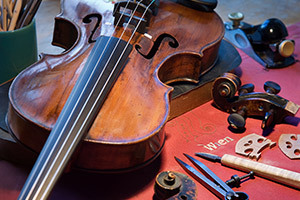 We can take care of restoring musical instruments of all kinds, including brass instruments, wood instruments, pianos, and acoustical instruments such as cellos, guitars, or mandolins. First, we will do a thorough evaluation of your property to see exactly what needs to be done. We will assess your property to discover the extent to which fire, smoke, soot, heat and moisture have impacted both building materials and contents, and we will inspect for safety and health issues. We keep thorough documentation including photos, so we can send your insurance adjuster whatever is needed to speedily process the insurance claim. After we assess your property damage, we will create a detailed strategy and immediately begin putting it into action. We will inspect the property for safety issues, making sure there are no hazards such as exposed gas lines, electrical exposure, or falling objects or building parts. We will secure the property to protect it from vandalism, weather damage and theft by boarding up broken windows, damaged doors and other open areas and by putting up portable fences. If the property is located in a dangerous area, we will have a security guard posted within 24 hours to keep watch over the property. We will prevent the damage from getting any worse by arresting the decline of the property and the contents. We will remove any water that is present in the property from the fire department’s efforts to suppress the fire. We will also remove wet building materials and carry out emergency mitigation of contents if necessary to prevent further damage by mold, which can start growing as soon as 48 hours after your property is exposure to moisture. We will separate the unsalvageable items from the items that can be restored or cleaned, keeping a separate inventory of both categories of items as a record. Salvageable items will go to our warehouse for immediate cleaning. Unsalvageable items will be presented to you for approval of disposal. If approval is granted, we immediately dispose of them. If you wish for us to salvage a very damaged item, we will do our best to follow your instructions in any event. We can restore vital documents, paintings, musical instruments and other special items. After the contents of your property are cleaned, we will store them in our warehouse in climate-controlled and moisture-controlled wood vaults to prevent the items from perishing, becoming stale or growing mold. If the client is going into temporary residence and wishes to have their stuff brought to them there, we will do that. We have relationships with highly skilled restoration specialists, which allows us to salvage any item that needs to be restored. Items that can be specially restored include artwork, documents, medical records, electronic equipment and musical instruments of all kinds. We will remove all the damaged materials from the building, including flooring, walls, lighting, cabinets and appliances. Once all the damaged materials have been demolished and removed, we will supervise the reconstruction by the restoration company. We become a single point-of-contact between you and the restoration company. We will clear out the smoke and fire damage in all the air ducts and furnace and clean them. We will bring the contents back to the house after the restoration is complete. To make an appointment, call 510.351.7510 or click here to request an appointment online. “In an age when it is getting rarer to encounter people who deliver what is expected, Water Damage Recovery stands out. Serving San Francisco, Oakland, San Jose, Santa Rosa, Stockton, and surrounding areas. Site created by Gilleard Marketing ©2013-2019 Gilleard Marketing. All rights reserved. Custom photographs ©2013-2019 Keith Gilleard and Gilleard Marketing.